Straight off the bat, it’s clear the lens fixed to the Coolpix A is a top performer. A DxOMark score of 22 shows that before you even dig down into the details. In fact, in the DxOMark rankings, this lens is fourth overall when compared against other prime lenses mounted on the Nikon D7000 – it is only beaten by three outstanding performers, the Sigma 35mm f/1.4 DG HSM A, the Nikon 85mm f/1.4G and Nikon 85mm f/1.8G. This is certainly rarefied company for a lens on a compact camera. As soon as we drill down into the individual tests, it becomes clear that this lens performs well across the board. 13P-Mpix for sharpness is very respectable and crucially, the sharpness is really quite consistent across the frame. The distortion score of 0.3% is very good too for a 19mm lens and while vignetting scores -1.7EV and Chromatic aberration 9μm these both represent well-controlled marks on a lens of this type. The only real downside that could be highlighted with this lens is that it is a prime lens rather than a zoom, and hence offers less versatility. However, given the typical use this camera will be put to, a high quality prime lens actually makes more sense – especially given the inherent compromises in zoom lens design. Comparing the lenses on these two cameras may seem unfair on the Nikon, given the $1700 price differential, but they fall within the same camera genre and have similar aims, so it makes for an interesting comparison. 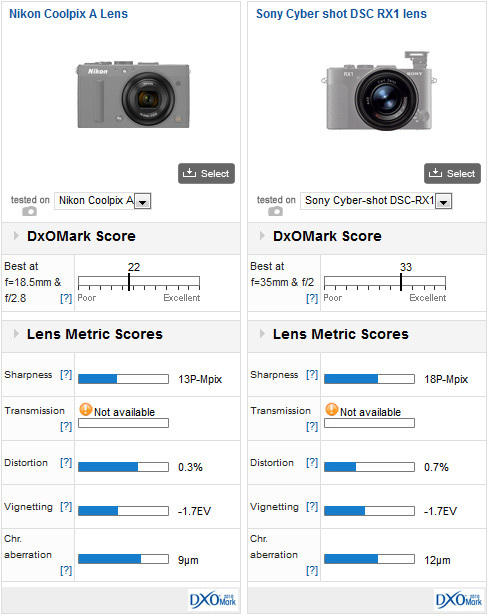 If we look at the headline figures, the Coolpix A does not fair too well against the RX1, scoring 11 points less in the overall DxOMark scores. However, we must take into account the very different sensors – the Nikon features a 16Mpix sensor, to the Sony’s 24Mpix so you would expect a higher P-Mpix result from the Sony. However, if we look at the data in a different way, the overall resolution of the sensor differs by 8Mpix, but the sharpness only differs by 5P-Mpix, suggesting that the Nikon combo is actually more efficient than the Sony. In all other areas, these two lenses are similar with approximately equal distortion, vignetting and chromatic aberration scores. This comparison shows the different approaches by two of the major manufacturers. Nikon have chosen a prime lens for their flagship compact, while Canon have selected the versatility of a zoom lens. In terms of the cameras, both models feature roughly the same size sensor and similar sensor resolutions; the key difference is the lens. As with the RX1 comparison, there is a 11 point difference in overall DxOMark scores, but this time the Nikon comes out on top (22 vs. 11). Again though, this is largely driven by the sensor performance, with the Coolpix A benefitting from a markedly better sensor than the G1X. Even comparing the two lenses at roughly similar focal lengths (18.5mm f/5.6 for the Nikon and 21mm f/5.6 for the Canon) we see that the Nikon lens produces a substantially more homogenous sharpness result across the frame, which accounts for the 7P-MPix difference in sharpness scores. In other areas, the chromatic aberration is roughly equal on both lenses. Overall, the G1X may be versatile but the image quality is lower at all focal lengths and apertures. Conversely, the Coolpix A gives away versatility in search of much better image quality. As technology improves, we are seeing compact cameras beginning to get close to the performance of their DSLR brethren. Unfortunately, this closing of the gap is currently only possible with compacts that feature prime lenses rather than zooms, but no doubt that will change over time. 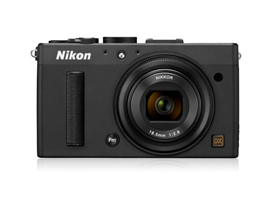 For now, the Nikon Coolpix A offers very high image quality in a compact body, with a remarkably capable lens. If a prime lens suits your needs, it makes a very good choice.